Market 137: SVZCT 10126*00184 pretty please??? Update 10/29/11: Auction has been pulled. Almost certainly a scam. Update 10/29/11: This car is on eBay right now out of Morrison CO. Picture are the same as those marketing the car at Fantasy Junction in 2009. 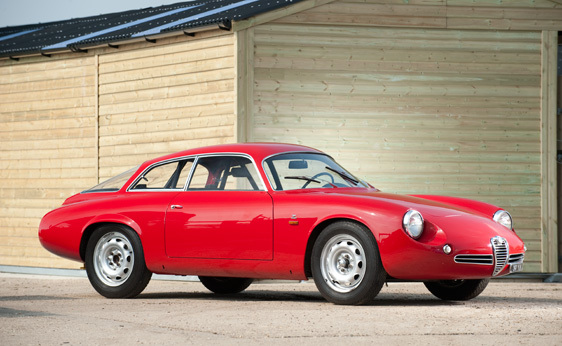 Update 4/9/11: This charmer is going to be auctioned by RM at Villa d’Este on May 21st. Still my favorite! I just noticed I don’t have a register for Zagato variants and I don’t have many pictures. Anyone want to share their collection? Seems to have been treated well since the last visit to these pages. 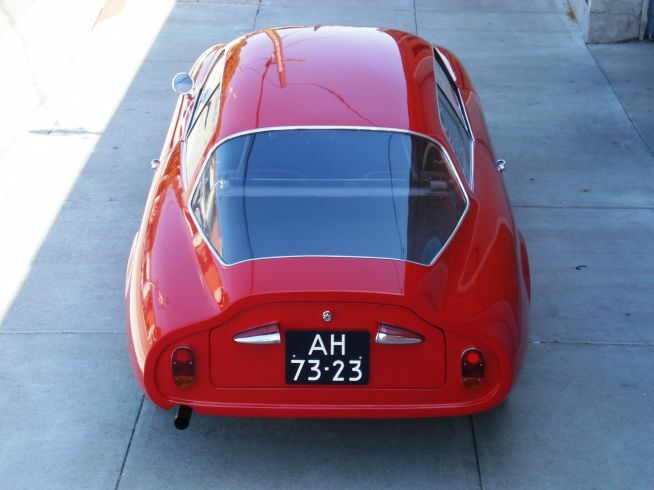 Originally posted 8/1/09: Giulietta Sprint Veloce Zagato II ‘Coda Tronca’ 10126*00184. That’s one mouthful of a name. This desirable object is probably parked beside the subject of Market 136 in the Fantasy Junction showroom. 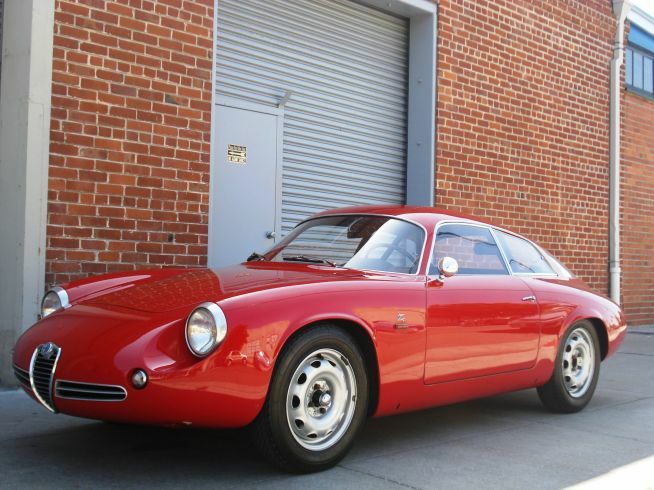 For the $355,000 asking price of this jewel you could buy two of those Lightweight Sprints and throw in the Fulvia Zagato with the remainder and still pay most of the tax and reg. Austere is a good word for these -at least the ‘markedly simple’ part of the definition. The beautiful form of a shape derived solely to fulfill a function. Light weight, low drag coefficient, low center of gravity and yet unmistakeably a Zagato creation. This particular model, of which so few were made, is possibly my favorite. Kamm tail styling is taken a step further than the SS but only hints at the radical treatment in store for this cars successor, the 105 based TZ. Paint, panel fit, trim stance everything is excellent. These tail lights remind me of the 2600 Sprint units. Long and low. If it came to a point it would be a 24 foot long car and be a disaster in a rear end collision, not just to repair but it would probably impale the following driver. Again, this kind of supple capable stance doesn’t happen without a lot of effort. The work required to get everything to fit in this package must have been intense. 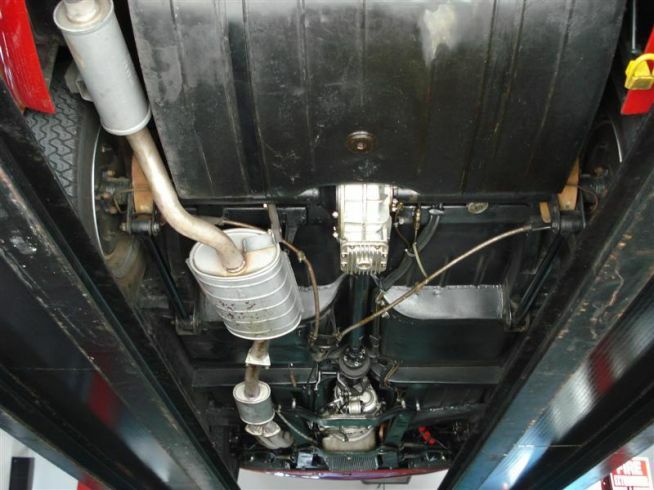 I suspect this car had some sweet period correct wheels that the seller was loathe to give up so it has these steel Fergats. 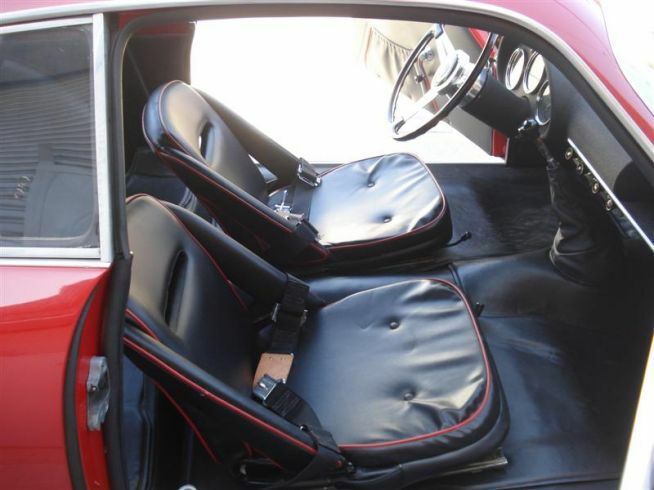 Even lowly normale’s usually get Borrani’s steels when restored. That said, I like the look of the Fergats with the trapezoidal oval. Gauges are a bit yellowed, but are original. 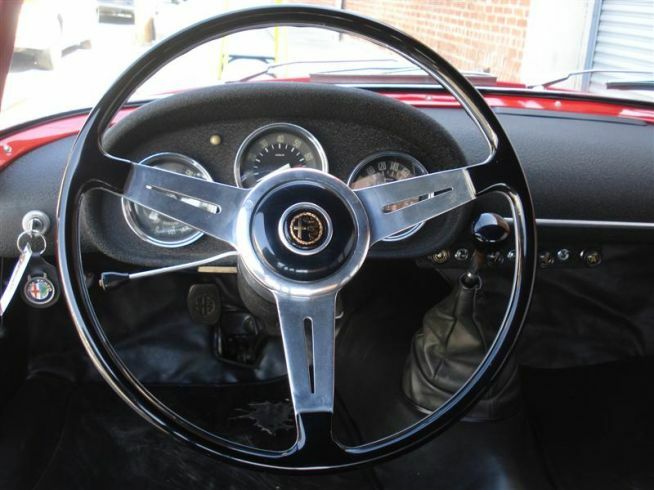 Steering wheel looks great. Note all the switches in the lower dash center are common Giulietta range components. Wrinkle finish dash looks great. 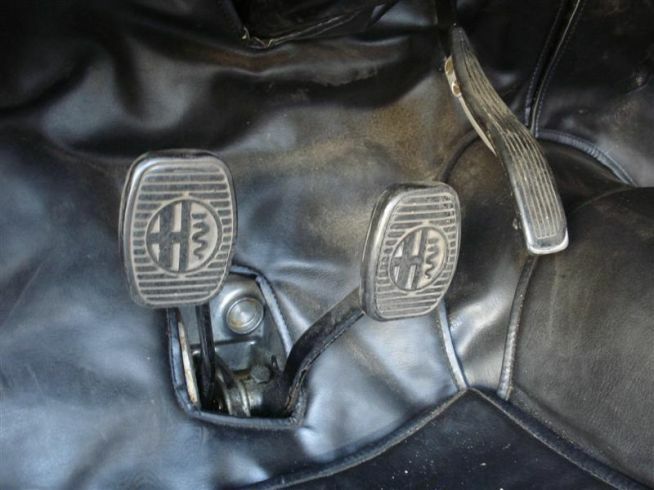 No brake pedal return assist sprint? I guess it was too heavy. 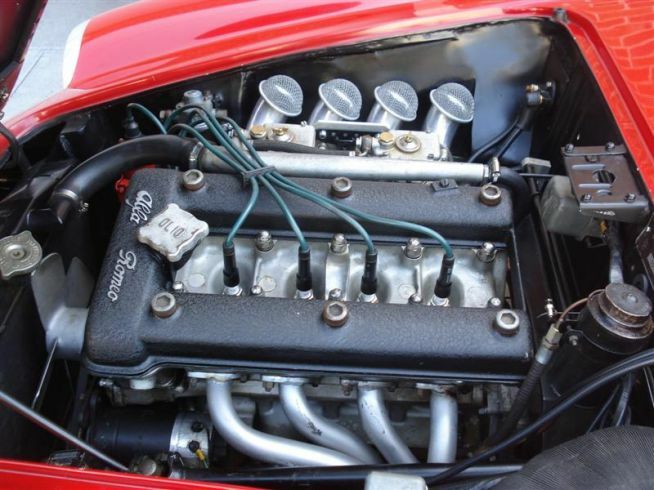 It is claimed that this engine was tuned by Conrero (along with most of the rest of the car) in the late 80’s/early 90’s, and makes 135hp. If accurate that is Grand Prix spec for a 1300! All the stuff where it belongs and looking good. I’ll take it. Big money for sure. Big enough that fakes exist and no matter how authorotative the seller sounds and convincing the receipts look one has to do some digging to make sure what they are buying is the real deal. 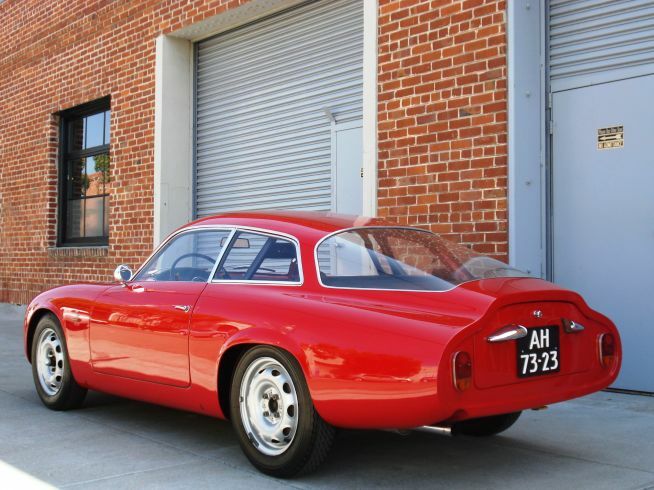 This entry was posted in Giulietta & Giulia Market, Race cars, Restored Cars, SZ's and tagged Alfa Romeo, cars, Classic cars, Zagato by Hamilton. Bookmark the permalink. What is the dutch license plate doing there?? Pulled off eBay. Might be fraud involved. He did publish the full vin. Looked fishy to me. 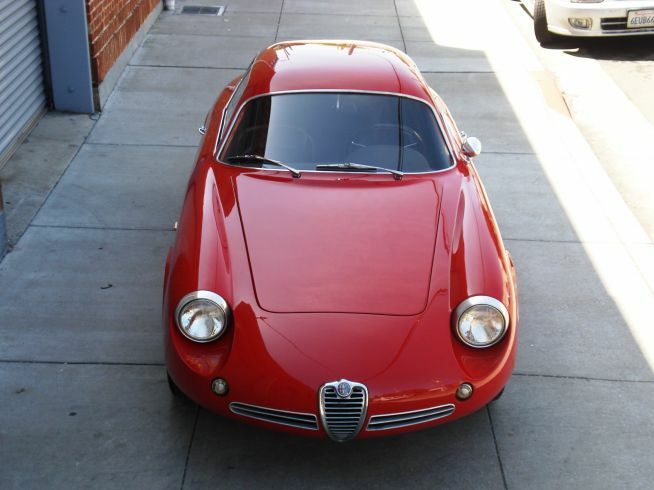 Check out what the Alfa Bulletin Board has to say about this car. Fantasy Junction does a lot of international business. Motorcars of many nations pass through that showroom regularly, look at their past sales! It is a wonder to be near such a changing display of exotic macchine. Laurence -Too true! I’ve seen more amazing machines that most people thanks almost entirely to the 20 million in cars FJ has on hand at any given time.